Thanks to Dr. Don Xu, University of California, San Diego, for contributing this case. To contribute a Case of the Week, follow the guidelines on our Case of the Week page. (1) We have posted the pre-USCAP meeting Promotions page with special offers from our advertisers. Click here to view them. (2) We have just about converted all 80 chapters to our popular topic format - see the recently updated Aggressive Angiomyxoma topic as an example. Next we will be adding more images from various sources, adding some new chapter sections, and continuing / expanding our topic reviews. (3) We are looking for authors for these existing chapters: Clinical Chemistry and CNS nontumor, and for new chapters on Heart-nontumor, Informatics, Muscle Pathology, Quality Control (CP), Pediatric Pathology and Syndromes. Authors first provide us an outline of what they want to do, then start with a topic or two. You don't have to complete the entire chapter. If interested, contact us. 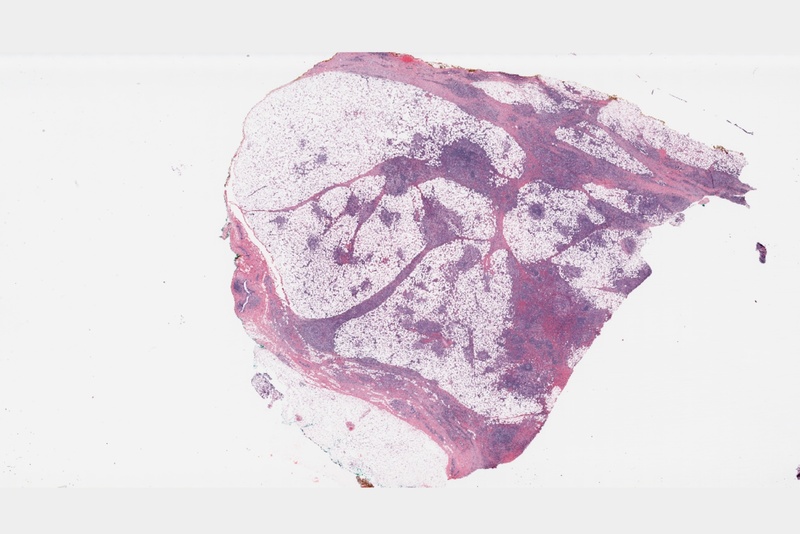 (4) We have updated these CD Markers: CD20 and CD21, and added these new stains: MAST2 (rearranged in 2% of invasive breast carcinomas), MED12 (mutated in most uterine leiomyomas), PHF1 (rearranged in most ossifying fibromyxoid tumors), SOX10 (expressed by melanocytes / cells of neural crest origin, breast myoepithelial cells). (5) We have added new Board Review questions for January and February 2014, courtesy of BoardVitals, which are accessible via our CME page. They relate to translocations / cytogenetics and clinical pathology. (6) The Home Page has a new Surveys button on the left hand side linking to a list of surveys for different types of pathology related businesses that you may be interested in learning about. Right now, we have surveys of Computer Systems - AP/LIS and Laboratories (for specimens and second opinions) . We will be adding more company surveys, and more types of surveys, over the coming months. For more information about how your company can be included, please contact us at 248/646-0325 or pathoutads@gmail.com. (7) We continue to add conferences to our Conferences page. Conferences are now listed by date, date posted, subspecialty and location. To see the most recently posted conferences, click here. Are your favorite conferences advertising at PathologyOutlines.com? If not, please suggest that they do so. The cost is modest, but the rewards are great. 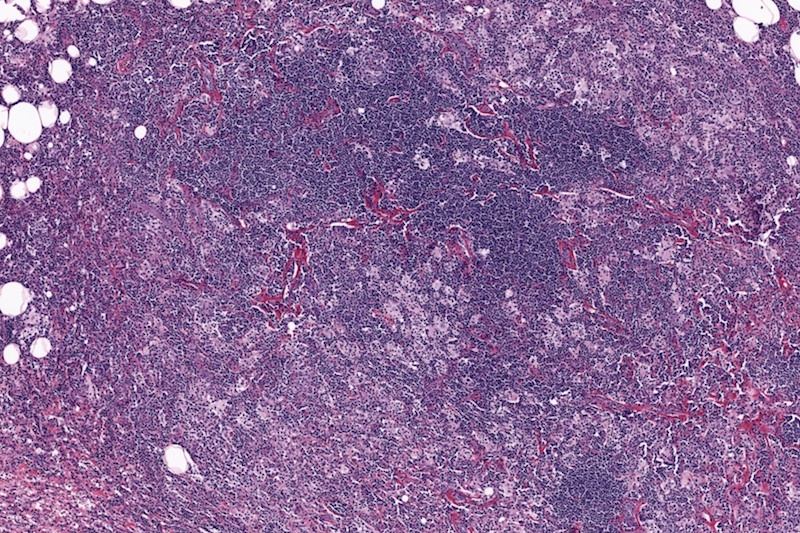 A 45 year old woman presented with a right breast mass, which was biopsied. 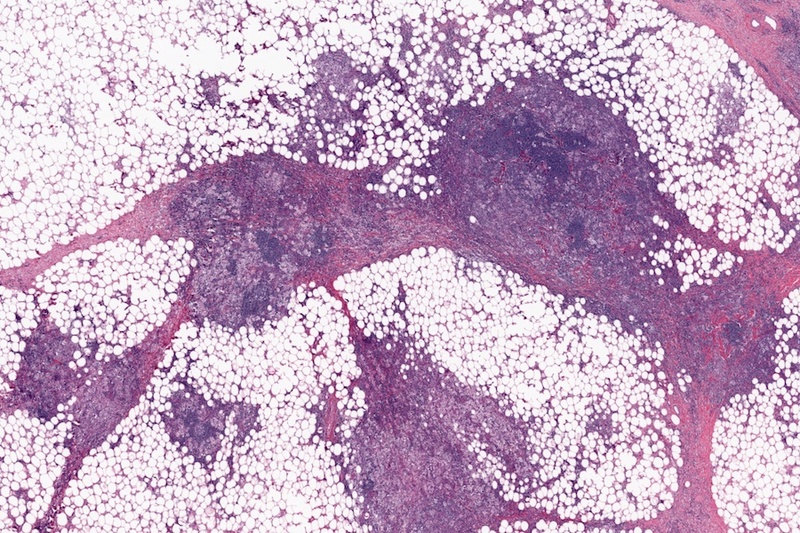 Rosai-Dorfman disease, also called sinus histiocytosis with massive lymphadenopathy, is a disorder of massive lymph node involvement that may also involve extranodal sites. It often presents with systemic symptoms (fever, leukocytosis, anemia), and most commonly involves the skin, subcutis / soft tissue, upper respiratory tract, bone, eye or CNS. Cases in the breast are rare. Grossly, there are circumscribed, often multinodular masses in the breast stroma, which typically do not involve the dermis or subcutis. 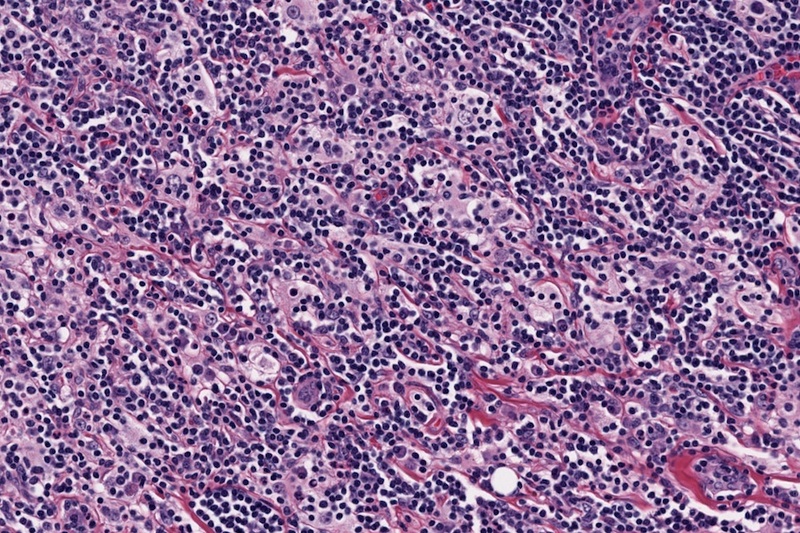 Histologically, large histiocytes are present with abundant pale eosinophilic cytoplasm and mildly atypical round vesicular nuclei (Am J Surg Pathol 1997;21:664). 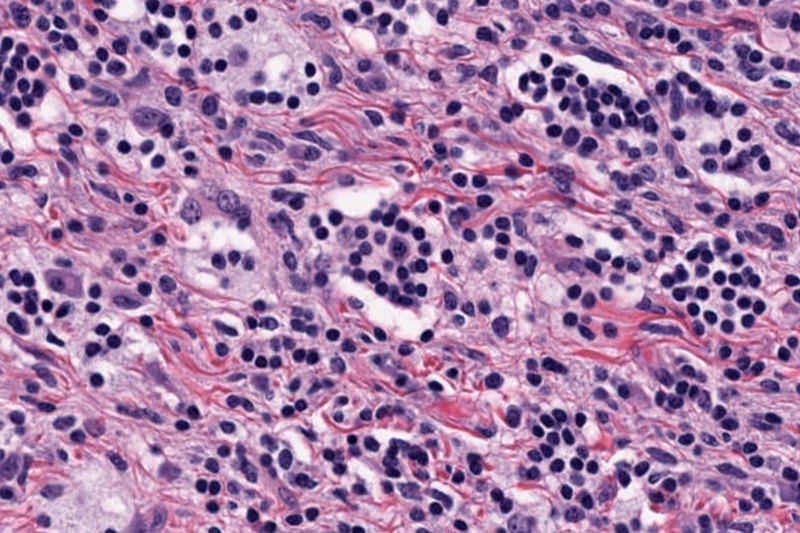 The background shows lymphocytophagocytosis (emperipolesis) in a background of mature lymphocytes and plasma cells. The histiocytes are immunoreactive for S100 and CD68 and negative for CD1a. 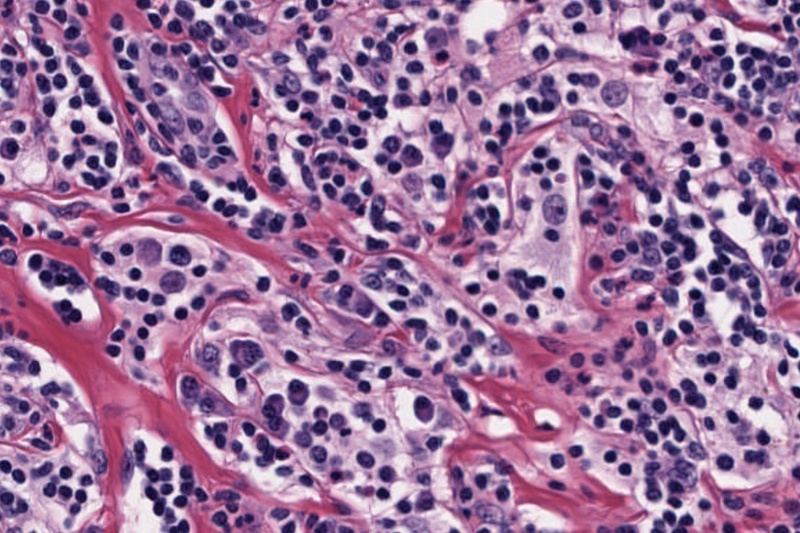 ● Benign fibrous histiocytoma: storiform pattern of spindled and bland fibroblasts and histiocyte-like cells in mid-dermis and subcutaneous tissue with infiltrative margins but sparing epidermis.